Fred Sheehan clearly dislikes former Fed chairman Alan Greenspan even more than yours truly, now having written two books on the subject. 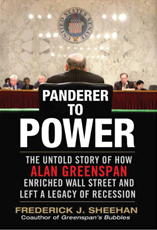 Recently released Panderer to Power: The True Story of How Alan Greenspan Enriched Wall Street and Left a Legacy of Recession follows Sheehan's earlier work, co-written with Bill Fleckenstein, with the more succinct (but more damning) title of Greenspan's Bubbles: The Age of Ignorance at the Federal Reserve. Q. What was Alan Greenspan’s greatest influence on the United States? FS: Alan Greenspan was the kingpin in the impoverishment of the American people. The middle class barely exists today, though the barrage of government spending prolongs the illusion of stability. As Federal Reserve chairman, Alan Greenspan’s pronouncements were sacrosanct. He told the American people they were getting richer when they were becoming poorer. It is axiomatic that when savings are depleted and debts are rising the person, or company, or government is poorer. It's hard to argue with that summary. And a few more questions in which it becomes clear that the former Fed Chairman was the perfect fit for the late-20th century U.S. economy, then in the process of completing its transformation to one based on finance more than ever before, unfortunately, to the detriment of the hundreds of million of non-finance sector Americans. Q. How did Greenspan create an illusion of recovery, based on complex math-designed products, rather than the creation of goods and real jobs? FS: The American economy’s recovery from the early 1990s was financial. This was a first. The recovery was a product of banks borrowing, leveraging and lending to hedge funds. The banks were also creating and selling complicated and very profitable derivative products. Greenspan needed the banks to grow until they became too-big-to-fail. It was evident the ‘real’ economy – businesses that make tires and sell shoes – no longer drove the economy. Thus, finance was given every advantage to expand, no matter how badly it performed. Financial firms that should have died were revived with large injections of money pumped by the Federal Reserve into the banking system. The change in the American economy can be seen in how profits shifted from manufacturing to finance. In 1950, 59% of U.S. corporate profits were from manufacturing; 9% from financial activities. During the past decade (2000 -2008), 18% of profits were from manufacturing and 34% from finance. Middle management, a staple of the middle class, had lost considerable ground during the early-1990s. Companies hollowed out middle management to cut costs. A large portion of those who were laid off never recovered financially. The same was true after the recession that followed the stock market bubble that popped in 2000, particularly among technology workers. Many have never recovered. Q. What role did Greenspan play in the financialization of the economy? FS. He cut the fed funds rate from nearly 10% in early 1989 to 3% by late 1992. This was the platform from which the financial firms borrowed at low short term rates and invested at higher long-term rates. This also chased the middle class into the stock market. Net cash flows into stock-mutual funds rose from $8 billion in 1985 to $79 billion in 1992 and to $127 billion in 1993. In 1992 and 1993, money market funds suffered net outflows. This was unusual: individuals were pouring money into the stock market when their incomes were falling (according to the Census Bureau). In addition to incomes falling, so had returns on fixed investments. They were chased into the stock market by the Federal Reserve. Q. Did Greenspan continue to influence destructive consumer behavior? That was in 1996, when he told the FOMC: "I recognize that there is a stock market bubble problem at this point.... We do have the possibility of raising major concerns by increasing margin requirements. I guarantee that if you want to get rid of the bubble, whatever it is, that will do it.” He soon retreated and claimed central banks could not see a bubble until it popped. Greenspan needed the stock market bubble to support the economy. Greenspan was no dummy when it came to enticing the public to speculate when interest rates fell. Again, behind closed doors, to the FOMC: “The sharp decline in long-term yields has struck me as quite extraordinary.... [W]e are getting issues of 100-year bonds…. The fact that some borrowers are issuing these bonds is terrific. Until you get somebody dumb enough to buy them...."
Q. Has Greenspan learned any lessons from the stock market bubble? FS. He certainly remembered how to lure the public into an inflating bubble: cut interest rates. The platform for wild housing speculation was the fed funds cut from 6.5% in 2001 to 1.0% in 2003. Money always chases the rising asset class, especially when so much of the money is superfluous to the “real” economy: From the time Greenspan was named Federal Reserve chairman until he left office, the nation’s debt rose from $10.8 trillion to $41.0 trillion. The “real” economy only grew by a fraction of that rate-of-growth. Alan Greenspan had turned the country into a gambling casino. The median cost of an existing, single-family house in California rose from $237,060 in 2000 to $542,720 in 2005. We can see the consequences are spreading far beyond the housing market. The state of California is cutting costs by laying off workers, not fixing sewers, and plans to release 40,000 prisoners. California leads the other states in trends. Greenspan’s legacy will be how he turned the United States into a third world country.